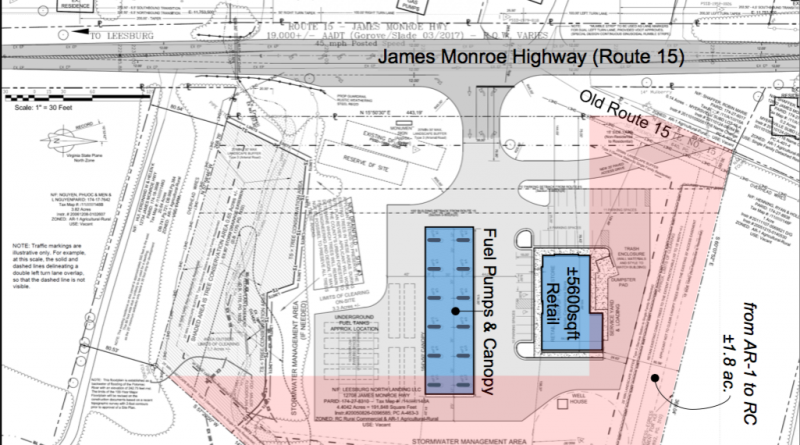 The Loudoun County Planning Commission is mulling an application to put what county planners say would be the largest gas station in Loudoun County on Rt. 15 less than a mile from the Point of Rocks Bridge. The owners of a 4.4-acre parcel across Rt. 15 from Cigarette Outlet have filed an application to permit up to 12 gas pumps with 24 refueling stations next to a planned convenience store. Representing the owners, Walsh Colucci Lubeley & Walsh PC Managing Shareholder Randy Minchew said the project primarily would be an country store, accentuated by the gas pumps. The owners of the property have made an agreement with Visit Loudoun to donate $25,000 to create an app to map out and tie together rural businesses in western Loudoun. He said the store would also have a 100 square feet set aside to showcase products from Loudoun County, along with a pollinator garden, two electric vehicle charging stations, solar panels on the fuel pump canopy, a small dog park, and a tree conservation area. “We hope that this facility is something that the community will enjoy and be an asset to Loudoun County,” Dicks said. But the project would also put what may be the county’s largest gas station in a rural area, on one of Loudoun’s most famously congested roads. It would also require expanding the footprint of a zoning district designed to allow for businesses in rural areas. County planning policies discourage expanding the Rural Commercial zoning district. Hancock said it has only been done three times before: Once for the Ashburn Volunteer Fire and Rescue Department’s new station in Old Ashburn; once to allow a new well at a site without safe drinking water because of problems with the old well; and once to expand a school system transportation facility near Hamilton. The Virginia Department of Transportation also has yet to approve the entrance to the lot, which will involve rebuilding the access to Old Rt. 15 and the homes on it. Neighbors came to the Planning Commission public hearing to express their concerns about the propose station’s size and its environmental impact. But Visit Loudoun President and CEO Beth Erickson said the site owner’s plans present an opportunity to engage people entering Loudoun from the north. “For us to connect the visiting pubic and that car traffic that is coming down Rt. 15, for us to connect those people with the agricultural products that are being produced in western Loudoun, to me was what really made this opportunity a very successful and exciting one for us,” she said. The commission voted 8-1, with Commission Jim Sisley (At Large) opposed, to send the application to a second meeting for more work. 24 fuel pumps? Seriously? In case you haven’t heard, the future of burning petroleum for transport is doomed with many countries and U.S. states banning the sale of new internal combustion vehicles in the next few years. Seems like a bad time to be investing heavily in expanding the gas pump infrastructure. I know these folks are trying to make this nice, but what a bad location. Forget making any left hand turns out of there.